“Born and raised in central Florida, I grew up playing in the woods, fields and orange groves. Now I find the wild natural places that brought me such joy as a child still bring me joy today. Unfortunately, these beautiful sites are rapidly disappearing. 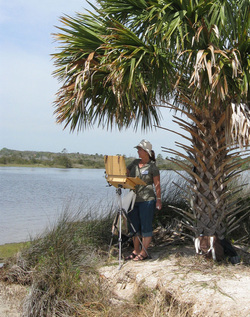 Photography and painting en Plein Air allows me to be outdoors and experience our natural places, and also preserve Florida’s beauty on canvas for future generations.” Most of my paintings are natural scenes painted en Plein Air, (French for in the open air). These paintings have a loose spontaneous feel as they are done quickly to capture the moment. I also enjoy painting in the studio too! There I can take more time and get more details in a scene. My first venture into art began when my dad gave me an old 35mm camera when I was 12. From then on I loved composing a scene in the viewfinder and watching it develop. Photography gave me a great base of knowledge to begin painting. Today I still can’t resist taking a few shots while out scouting painting locations. A native Floridian, Sharon is a graduate of the University of Central Florida and has also studied at Crealdé School of Art in Winter Park, FL. and the Mt. Dora Center for the Arts. She and her husband reside in Central Florida. To inquire about photographs or paintings, just send me a note. Credit cards accepted & shipping is available.